‘So I say to you, Ask, and it will be given to you; search, and you will find; knock, and the door will be opened for you. For everyone who asks receives, and everyone who searches finds, and for everyone who knocks, the door will be opened. - NRSV. In the gospels we read frequently of Jesus going off to a quiet place to pray. It was the way by which he communicated with his father. He taught his disciples to pray - see the panel to the left. As descendants of those first disciples we too should pray. Prayer is the way by which we communicate with God, and we provide many opportunities for people to pray. First, though, we must remind you that everyone can pray at any time and wherever they are. Sometimes on Sunday and through every week we have services of prayer. Periodically, usually on a Saturday, we have a day of prayer. There is normally a theme to these days with people invited to come and go as they want. Our weekly newsletters carry information to help members of our congregation with prayer topics for the coming week. The newsletter is expected to be taken home by congregation members, and is also available for use in church through the week. Prayers utilising our book of healing. This is a book into which people can write the names of people who are sick and in need of healing. Jesus taught that whenever two or three are gathered together in his name he will grant their requests. 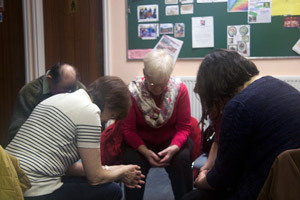 Prayer triplets is an arrangement whereby members of the church are grouped into threes, who then meet together for prayer at some convenient location. We have a well developed email system for distributing prayer requests. The request may include thanks for answered prayer or requests for specific needs. While our study groups meet to study the bible, there will normally be a time of prayer every time a group meets. According to press reports, only about 50% of people know the words of the Lord's prayer. It is now recited in both traditional and contemporary versions and we are happy to provide the words for both. The traditional version is on the left, below.